China Glaze Nail Polish, Glitter Goblin, 1134, .50 fl. oz. 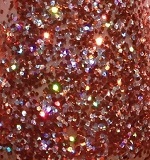 Deep orange, silver and holographic glitter in clear base.